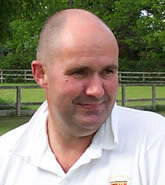 Andy Witcombe, sometimes known as the run machine, Wit and formerly Bunter is without doubt the highest scoring batsman ever to grace the Chew Court ground. In fact he is in the top 5 of all time run scorers in the Somerset League, with well over 20,000 runs to his name. The destroyer of many an attack, Andy has hit 800 plus runs in a season in the Premier Division. How he missed out on playing for the League XI or even Somerset II's is a mystery. His bowling days are coming to end now, but in his heyday his accuracy and consistancy claimed many a victim. Haircut needs some attention though.